Imagine that you are organising a meeting. 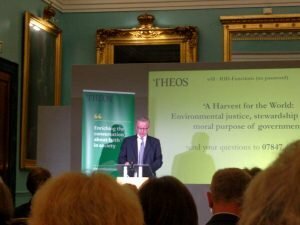 Months before the date you have a big hit and you manage to book Michael Gove (The UK Secretary of State for the Environment, Food and Rural Affairs) as the speaker for your annual (Theos) lecture on 22nd November 2018. You arrange the venue and start sending out the invitations. You are very happy with the uptake and the event is so popular that it fills and you have a waiting list. But then the week before your event total chaos breaks out in the UK government over Brexit. Will Michael Gove be made Brexit Secretary? Will he resign altogether? Will he just be too busy to speak at your meeting? Any of those scenarios would have caused the cancellation of the meeting you had spent months putting together. Having arranged many meetings and conferences I had considerable sympathy with the organisers. They must have been wondering right up to the last minute whether their man would show up. 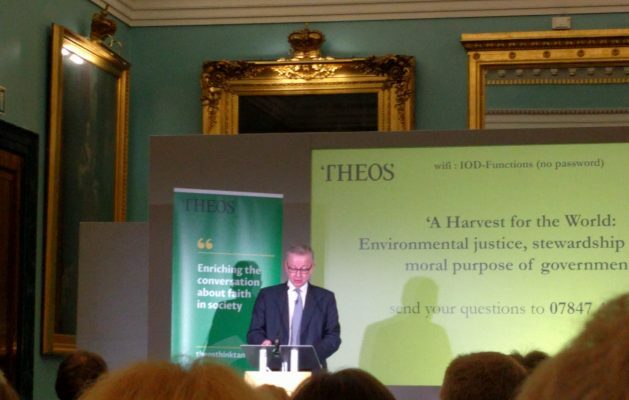 When Michael Gove was appointed many environmentalists were pretty horrified. But actually, he has turned out a lot better than many of us expected. It is fair to say that the farmers have been less keen. And in the background, all of the time has been Brexit. Can you have a green Brexit? Will things be better, or will we slide into environmental deregulation as many fear? Gove did not mention Brexit in his talk, but it was bound to come up in the questions which were chaired by Elizabeth Oldfield. He admitted that the EU had generally been good for the environment, but he felt there would be opportunities to improve things outside. In particular, he was not keen on the Common Agricultural Policy or the EU fisheries policy. He did not feel that we would have worse environmental legislation outside the EU and cited a “virtuous competition” that was already taking place between the UK and the EU over single-use plastic. They were vying with each other to bring in stronger legislation faster. Asked how long he would stay in his present job he said that he hoped it would be a long time, but that one never knew with politics. Speaking with other attendees after the talk and looking at the responses on Twitter (see #theosgove) the majority of people were very impressed with what Gove said. However, many saw a mismatch between what he said and UK government policy on the ground. One only has to think of fracking in Lancashire for example. Or policy on renewable energy. Or housing regulations. This mismatch only came up once in the questions when the lack of policies to deal with climate change in the recent budget was raised. Gove rather skirted around that. Overall it was a very good evening. Thanks to Theos for inviting me, and I guess you will all be sleeping a bit better now!